All of this got started when my wife bought a new Oscar Schmidt autoharp, and then spent a bunch of money getting it fixed to play. Shortly thereafter, I started to play the autoharp, and needing the same modifications, decided to learn to do it for myself. Friends then started to ask me to work on their harps. 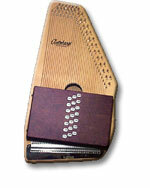 After refining the modifications and talking with some autoharp makers, I found more and more friends requesting my services. Numerous festivals later, my services were being recommended by well known players.